The two-house Budget Conference Committee kicked off debate over the 2018-19 state budget this week. At this stage of the process the Assembly and Senate are working to reconcile their respective versions of the budget. Simultaneously, representatives from the Governor’s Office are meeting with senior staff to the Assembly Speaker and Senate Pro Tem to finalize a budget deal that gives all parties a win of some kind. 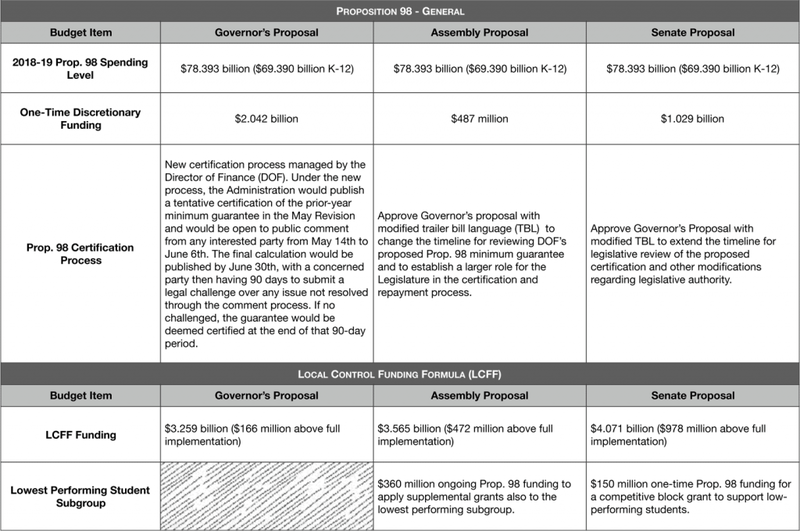 We have compiled a matrix of major budget items and the different approaches by the Governor, Senate, and Assembly. As we discussed in our budget workshops, the election-year dynamics are working in our favor as the all three versions of the state budget propose a higher Prop. 98 minimum guarantee in 2018-19, despite a debate over attendance and other changing factors that drive the guarantee. Prop. 98 Guarantee – There is universal agreement on the Prop. 98 minimum guarantee for 2018-19 at $78.393 billion ($69.39 for K-12). Local Control Funding Formula (LCFF) – All parties are proposing to fund the LCFF beyond full implementation in 2018-19 (the Governor by $166 million, the Assembly by $427 million, and the Senate by $978 million). Lowest performing students – The Legislature is seeking additional resources for the lowest performing subgroup of students, with the Assembly proposing $360 million (ongoing) to include these students in the LCFF supplemental grants, while the Senate proposes $150 million (one-time) for a competitive block grant to support these students. 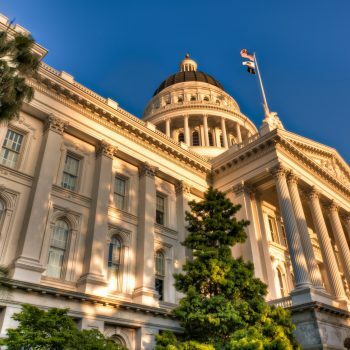 Future base grant increase – The Assembly is also advocating for intent language for the base grant rates of the LCFF to be set at the top ten percent of states in 2019-20. Transparency – The Governor proposes a new summary document that links budget expenditures to LCAP goals, actions, and services. The Senate and Assembly have adopted the Governor’s proposal but require the proposed summary be part of the LCAP’s executive summary. One-Time Discretionary Funding – The Governor proposes $2.042 billion, while the Senate proposes $1.029 billion, and the Assembly proposes $487 million. Career Technical Education – The Governor proposes $212 million (ongoing) to fund the Strong Workforce Program through Community Colleges; while the Assembly proposes $400 million (ongoing) to make permanent the CTEIG program administered through the CDE. 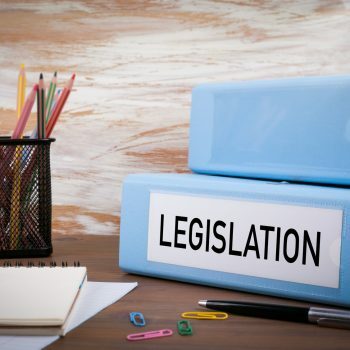 The Senate adopted the Governor’s proposal, but modified the language to require half of the funds be administered through Community Colleges and the other half for other high-quality CTE programs, with a role for CDE. Special Education – The Assembly’s version of the budget provides $200 million (ongoing) to equalize special education funding rates. The Governor and Senate do not propose additional funding for Special Education. County Offices of Education (COEs) and Statewide System of Support – Both houses of the Legislature adopted the Governor’s proposal to provide $57.8 million (ongoing) for COEs to assist in the provision of differentiated assistance to school districts identified under the new Dashboard. They also all agree to provide $4 million to fund 6 to 10 COE regional lead agencies to assist other COEs with this work. We expect the Governor, Speaker and Pro Tem to finalize an agreement sometime after next week’s election. It’s likely the Conference Committee will vote on a final budget package late next week or early the following week and send it to the floors of each house for a vote, where it will almost certainly pass and be sent to the Governor in advance of the June 15 deadline.